Warhammer 40,000 holds its origins in a tabletop miniature game with a moderately deep fictional universe as its setting. Throughout the years, this universe has been captured by various video games. Yet, very few if any of them allowed players to directly be one of the super-human space marines. Warhammer 40,000 Space Marine is one of the first that let players be one of the famed Ultramarines in the Warhammer universe. Is being a space marine all that it is cracked up to be? In Space Marine, you play as Captain Titus of the Ultramarines. The Imperial Forge World of Graia is being invaded by Orks, and Titus with his men has been deployed there in order to secure any Titan war machines and mow down any Orks that stand in the way. 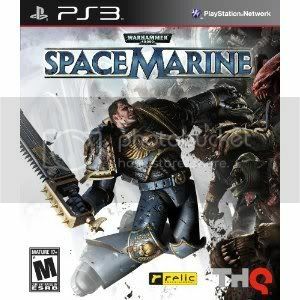 The story of Space Marine is typical action game fair, albeit it can be pretty dull and boring through most of the game. Most of the cast is pretty lifeless and forgettable. There are occasional glimpses into the history of the events of Warhammer, but anyone not familiar with the rich universe will feel a bit lost here. Aside from the story, one thing that immediately stands out when playing Space Marine is how lets you feel how badass the Ultramarines are. They look like walking human tanks, and with their hulking footsteps you get a sense of the heavy armor they wear. Yet, they move with relative ease and are capable of tearing through legions of Orks singlehandedly. In the opening parts of the game, Titus takes down an entire warship which crash lands with him on it; but he walks away from the wreckage seemingly unscathed. Even the soldiers of Graia hold Ultramarines in the highest regards, being honored by the opportunity of just seeing them. When actually controlling Titus, players will feel like a badass. In combat, you are capable of using an assortment of ranged weaponry. Sci-fi versions of the usual pistol, assault rifles, shotgun, and sniper rifle fill out the traditional selection of weapons; each behaves as you would expect and have their uses in the same types of situations as any shooter. There are the occasional heavy machine gun turrets that can be used to tear through mobs, but Ultramarines are also capable of tearing it off its pedestal and use on the go. Headshots will very often result in heads exploding in glorious fashion. The shooting in Space Marine is satisfying enough, but does not offer much in anything that has not been done before. However with the sheer number of attacking Orks, battles will inevitably get up close and personal. Ultramarines also excel at hand-to-hand combat armed with chainsaw swords, axes, or hammers. Transitioning between ranged and melee in Space Marine is quick and seamless, and melee combat is brutal. You will see lots of blood fly as each swing tears through swarms of Orks. When enemies are knocked into a dazed state, you can perform an execution which is even more over the top with the bloodletting. Melee combat and executions can really let you feel the power of the Ultramarines. 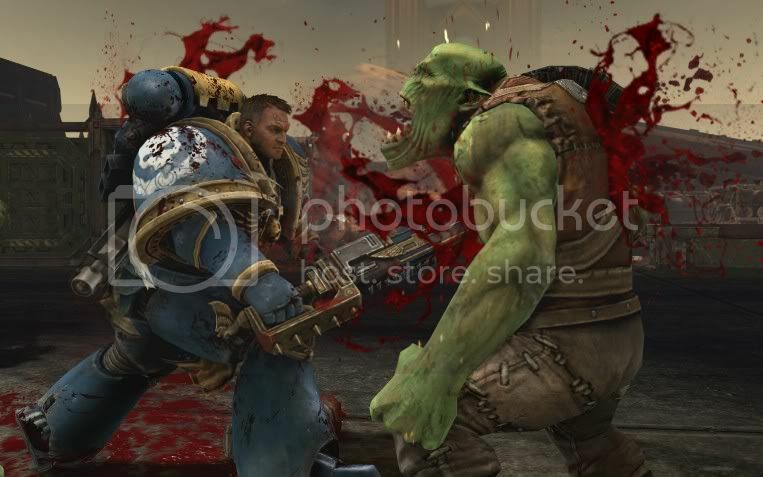 While it is satisfying to kill and execute Orks, that is not to say there are not issues. There is very little variety in melee combat. With only 3-4 combos available regardless of the weapon, it becomes very repetitive quickly. While the game’s intent is to mix combat up between gunplay and melee, the large hordes of enemies you go up against almost guarantee a larger focus on the melee which makes its shortcomings stick out more. Also while the executions are spectacular to watch, you are still very vulnerable to taking damage during it. Considering that you are stuck in the execution animation once it starts, it is rather risky to perform one while other enemies are still around. Executions are also one of the only ways in the game to restore health. It is rather irritating to be low on life under attack by a crowd, and not be able to perform a health-regaining execution due to the likelihood of dying before the animation finishes. There are a few points in Space Marine where the combat gets a refreshing change of pace by giving players a jetpack. The jetpack allows players to take to the air and bring death from above. It is incredibly fun to rocket jump up, and thrust yourself down like a lightning bolt into a group of Orks swinging a hammer. Each time one of these sequences comes around, the environment also opens up with more verticality which breaks up the corridor grind that the rest of the game is. It creates some real exciting moments where you feel godly with power. It is unfortunate that these moments are few and far between, and they end before you know it. When it comes to the Orks themselves, they behave very much as Warhammer lore describes them. Not very intelligent, they love to fight whether friend or foe, and they attack and overwhelm with large numbers. Some will just swarm the opposition, while some will sit back and pick away with gunfire. The sheer number of attacking hordes will keep players engaged with combat nearly constantly. However like many aspects of Space Marine, there is not much variety in the groups that attack. This results in most battles feeling too similar to each other. The hordes you kill in the early chapters feel the same as the groups late in the game. Even after the enemies change up late in the campaign, you are still dealing with them in same exact ways. Beyond the single player campaign, Space Marine offers a modest team based online multiplayer to dive into. Players have a choice of using one of three different classes which vary weapon and mobility options. The tactical class provides an all around balanced experience; devastators offer up heavy weaponry, but are not very mobile; and the assault class accels at close ranged combat mixed with high mobility via jetpacks. Class balance is fairly good, with each one tailoring to different playstyles. Each one of the classes can be customized with unlockable weapons and perks via a leveling system that is all too common in modern shooters. With using such a system, balance becomes an issue due to the unlockables that higher level players have give them large advantages over starting players. Space Marine tries to alleviate this by allowing players to copy the loadout of whoever killed them last. It is a novel idea that somewhat works, but it is limited by how the copied loadout only stays until the next death. It never really gives players much of a chance to get a feel of why a player is using a loadout. 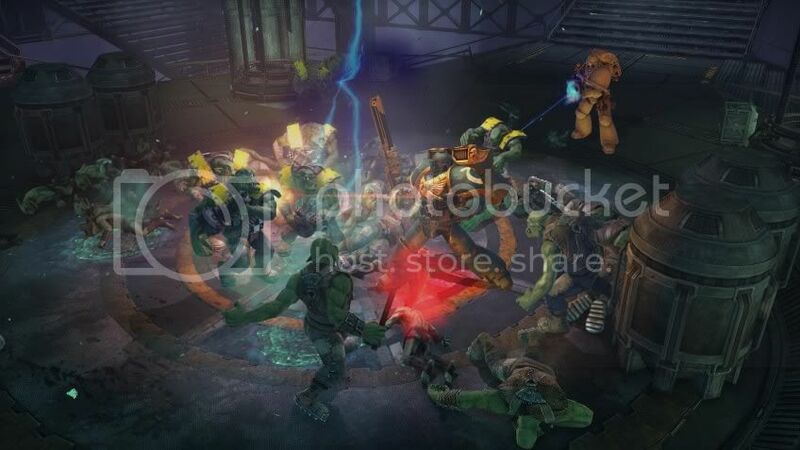 By default, Space Marine has two versus game types to choose from: Annihilation, which is the typical team deathmatch; and Seize Ground, which tasks teams to control points on the map to earn points. Both modes play out as you would expect them to. There are also two game types that were added in through a patch: Capture the Flag and Capture and Control, the latter of which plays like king of the hill. However, at the time of this writing both of the added game types had little to no one playing them. Also regardless of game type, there are only a dozen maps to play. Each map is fairly well designed, incorporate verticality, feature balanced layouts where no one class dominates, and generally fun to play. However, the paltry number leaves much to be desired. Aside from the versus multiplayer, a four-player co-operative mode called Exterminus was also added through a patch. This is very much like horde modes of other games where players are tasked to survive waves of enemies. Exterminus also uses the custom classes from the other multiplayer modes, which supports the teamwork oriented gameplay. Trying to survive hordes of Orks with three other players is just as fun here as ever. It is a shame though that there are only two available scenarios/maps for Exterminus. 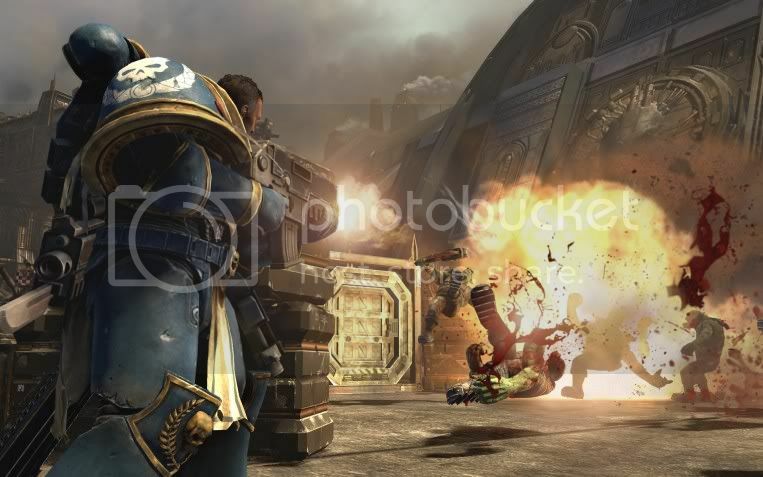 Visually, Space Marine is does its share of showing players the war torn world of Graia. There is shades of brown, grey, and not much else. The world is in ruin due to the Ork invasion, and the structure of the plot does not leave much room for providing much variety in environments. There is a nice amount of detail on character models, whether the worn look of the Ultramarine’s armor or the different details of Ork types. There is nothing ground breaking here, but nothing is lacking either. The audio side of Space Marine is in a similar situation. Sound effects are competent, and the voice work is modest. The iconic “waaagh!” battle cry of the Orks is fitting, but hearing them repeat “It’s the Space Marine!” every other line becomes rather grating to hear through the entire campaign. The music of the game is orchestrated like most games today, but has an emphasis on drum/percussion instruments, which gives off a feel of a tribal war drum. It is certainly fitting for the setting of Space Marine, but there is nothing particularly memorable about it. Overall, Warhammer 40,000 Space Marine does indeed give players a strong sense of what being a space marine is like. While the story is largely forgettable, combat is brutal and fun, but lacks variety and becomes repetitive very quickly. The multiplayer modes are typical as you would expect, though it lacks in available maps to play on. Space Marine never really ventures into groundbreaking territory, but it is a solid game that will provide a modest bit of fun.